A survey asking than 4,000 users about their future plans to buy a smartphone and their current satisfaction with their existing phone indicates Apple is erasing interest in BlackBerry devices among consumers while its iPhones continue to leave customers far more satisfied than any other smartphone on the market. A report on the survey, published by ChangeWave Research, also indicates a massive surge in interest among consumers interested in buying a smartphone over the next 90 days. The firm found that 52% of those surveyed plan to buy an iPhone, up from 31% saying the same just three months ago. Interest in HTC phones has grown slightly while Motorola's numbers were down, resulting in overall flat growth in interest among consumers in Android as a platform. Interest in RIM's BlackBerry and Palm smartphones trailed off dramatically, falling from 14% to just 6% for RIM, while Palm's 3% dropped to less than 1% across the same three month period. 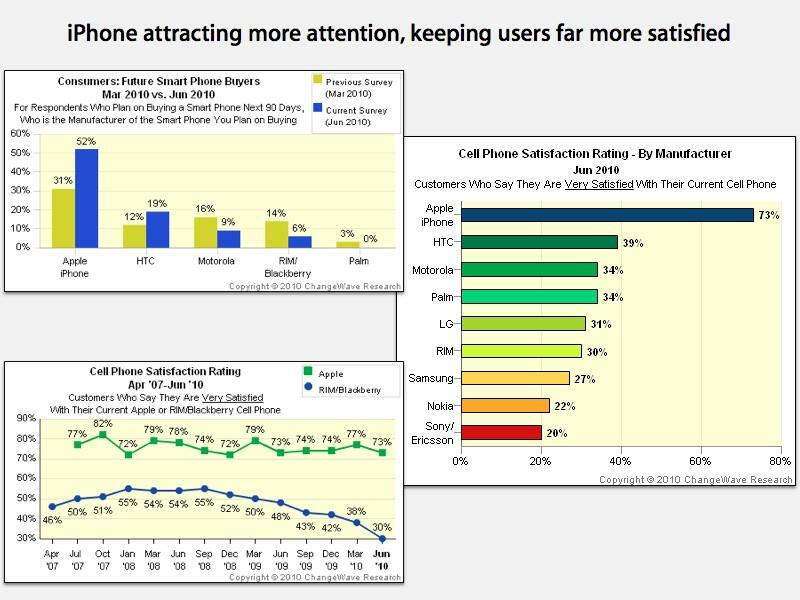 Customer satisfaction among smartphone users remained very high for iPhone users, with 73% saying they were "very satisfied." Only 39% of HTC users said the same, and just 34% of Motorola and Palm users did. Among other smartphones, including RIM's seemingly popular BlackBerry, just 20% to 31% of users could say they were "very satisfied." RIM's satisfaction rankings have been dropping steadily for the past seven quarters, according to ChangeWave. "In recent quarters RIM models appear to have lost their 'cool factor,' and the onus is now squarely on RIM to regain consumers' confidence in their products," ChangeWave wrote. "To do so they need new, highly compelling offerings that can compete on an equal footing with the best that Apple and Android have to offer. Otherwise, RIM's future growth may increasingly be limited to the success or failure of its lower cost models on the international market." Paired with the very low number of users planning to buy a RIM smartphone, ChangeWave's data indicates BlackBerry users who have been exposed to the iPhone are hooked, and not looking back. Additionally, users who have shifted from BlackBerry to Android report being far less satisfied than those who have moved to Apple's iPhone.